Preheat the oven to 450 degrees. Over medium heat, saute the onion until it becomes translucent. Add the garlic and stir. Add the spices and salt. Stir those around as well. 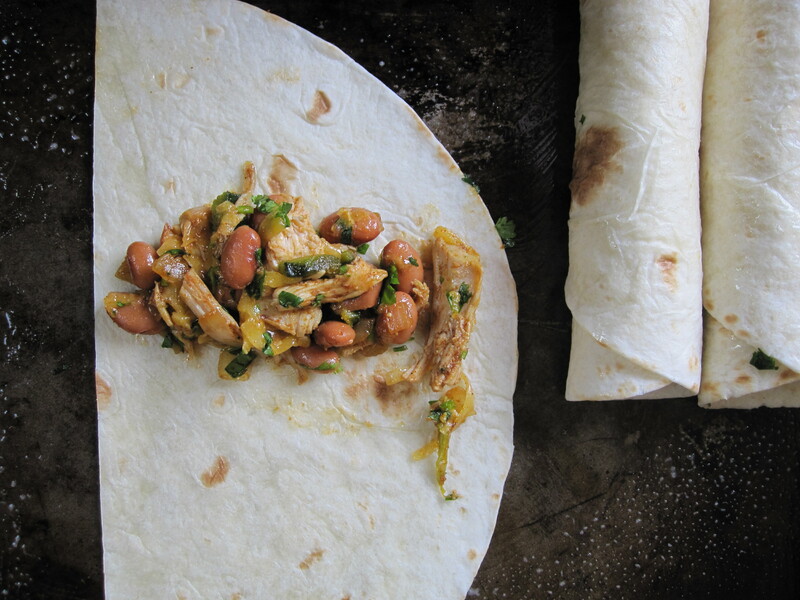 Add the chicken, beans, and peppers. Cook, stirring occasionally, until the mixture is warmed through. Taste to correct seasonings. Remove mixture from heat. 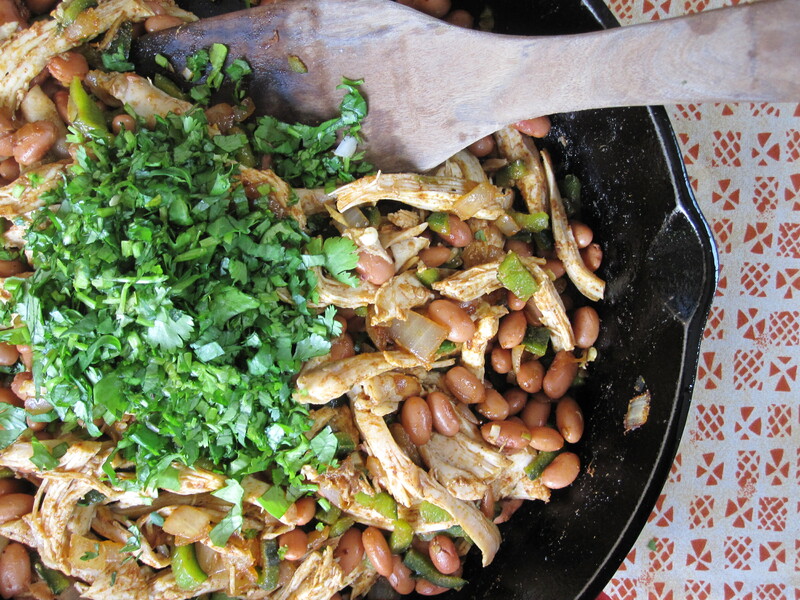 Stir in the cheese and cilantro. Brush or spray a baking sheet with oil. Lay out 1/2 of a flour tortilla. Scoop 1/4 cup of the filling onto the tortilla. Roll the tortilla tightly around the filling. Place each flauta seam side down on the baking tray. Repeat with remaining tortillas and filling. Brush or spray oil on the flautas. Bake for 10 minutes, then turn them over and bake for 5 minutes more. The flautas should be crispy and beginning to brown. I love that you refer to toy detritus. That stuff is the bane of my existence. The science teacher comes out in your writing and I love it. Mexican anything is usually a big hit with the kiddos around here too. We also like sweet/mildly spicy Asian chicken dishes (think hoisin based) and spaghetti topped with a quick bacon, onion, garlic, white wine, tomato sauce and parsley and parmesan. This is exactly the type of meal my kids adore, Karen! I remember the invasion of toys in our living room when my boys were little…now there’s the never ending tangle of ipods, phones and chargers on the dining room table! So great to hear from you, Amanda! 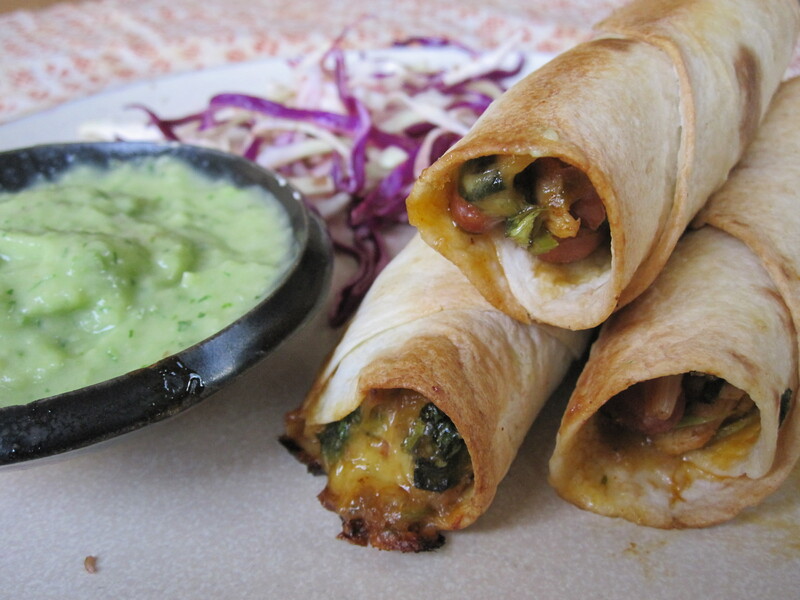 Glad you hear you haven’t given up on cooking :) These flautas are so fun to eat, they would be perfect for one of our playdate potlucks. So nice to know that you and Mia enjoyed them up North!